So this is it! The conclusion of Bulgarian Wine Month and it's ending with two examples of the indigenous grape called Mavrud! 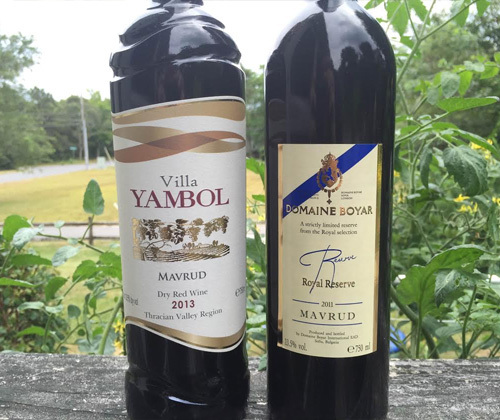 There's been three wines this month that got a perfect 5/5 rating: VINI Rosé 2013, Domaine Boyar Reserve Merlot 2012 and Villa Yambol Merlot 2013. This Mavrud show-down now becomes a rubber-match for the two 5/5 Merlot's. Villa Yambol (AKA Vinprom Yambol) was founded in 1924 and is the oldest winery still standing in southern Bulgaria. Here I have the two varieties that made Bulgaria such a great buy for wine in the 70's and 80's: Merlot and Cabernet. They're both from Thracian Valley and have strange, indented, wavy loops on the shoulders. Most Bulgarian wines you see imported into the USA will be from Thracian Valley, and that's not just because anything from Thracian Lowlands can be labeled as Thracian Valley now in the USA. 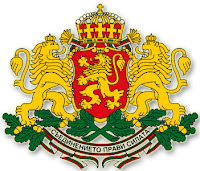 This is the place where Bulgarian wine gets its opportunity to harmonize with the American palate. The Balkan Mountains block the cold winds from coming down from Russia, so the combination of a temperate continental climate and the perfect amount of rain makes it best suited for red wine, although it produces some excellent white wine. It's also the home of Mavrud. Mavrud's fruit is small, low yielding and late ripening but it makes the #1 top selling local wine within the country of Bulgaria. It's inky in color, tannic, spicy and normally sees a lot of oak aging. Stewed fruit and herbs are its common flavor characteristics. It's only grown in the tiny area of Assenovgrad, north of the Rhodope Mountains. Legend has it that one of Khan Krum's (ruled 803-814 CE) many pet lions escaped its cage and angrily started killing the good people of the city. That same night a peasant man named Mavrud was sloshed off his mother's secret stash of wine and happened to encounter that same angry lion. So what did he do? What any good, upstanding, drunk young man would do. Of course he had to go to court for killing a royal lion because that was illegal, and his mother confessed in a desperate plea to turn the blame on herself that her son had gotten drunk off of her illegal wine. And just like that prohibition in Bulgaria was ended. Krum wanted all of his people to be as ballsy as Mavrud, so he allowed them to drink their courage. One of the wine grapes that the Thracians first cultivated was at some point renamed in honor of brave, drunken, lion-slaying Mavrud. Somewhere, momma is proud. Or that's how the story goes. Mavrud comes from the Greek word mavro, which means black. Mavrud being a black grape, and its wine deeply pigmented, it's probably more likely that the story was made up to honor the grape rather than the grape being named to honor the man. I've never had one so I have no idea what to expect other than what I've read and, then, written above. It's kinda scary, actually. I might slam the best Mavrud out there or fall in love with the worst. Not that I'm afraid of either. I gave Mumm Napa Brut a crap score and I like what I like. But I have no basis on what the average one is even like. Varietal correctness is thrown completely out the window here. This should be interesting so let's try some Mavrud already! These vines were planting in the heart of Mavrud-land back in 2006. Some of them see machine harvest but most are handpicked. The soil is maroon-forest and leached humus. Cold macerated with its skins for three days, stainless steel fermented, and around 15% is aged in French oak for three months. It has a 13.5% ABV. It's purple in color with deep density. I REALLY like the aromas. Lavender, moss, exotic spices, cranberry, and buffalo sauce. Yes, buffalo sauce. It's a very complex nose and very different from any other wine I'm smelled before. The palate is less complex with flavors of dark cherries, lavender and burnt toast. The longer you keep that wine in your mouth, though, the hotter and spicier it gets. It finished with tannin and exotic spices. Even with this being the first Mavrud I've ever tasted, my instincts tell me that this is a good introductory Mavrud. Can't tell you much about this one except that it's "strictly limited" and got 88 points from Wine Enthusiast. There's a 13.5% ABV. From my previous reviews it seemed that Domaine Boyar's prerogative is unimpressive whites and big juicy sweet reds. They made it work with the Merlot though. That thing was aweeeesooooome. This Mavrud is garnet red in color with less density than the Villa Yambol. Vanilla is crazy huge on the nose, and then there's lobster shell and cherry cola. And is that my wife's Shae Butter Eucalytpus moisturizer? They really like their sweet theme because this has that same thing going on. That raisinated, appassimento-like touch of sweetness. There's flavors of dried cranberries, tar and spearmint. It heats up rapidly just like the Villa Yambol and it finishes with tannin and bitterness. After reading that description again it looks like I would love it. But I don't. It just didn't work for me and it's also the most expensive wine I've reviewed all month. I hate to end such a fun month on a downer but I've got to give it a 2 out of 5. So what I got out of Bulgarian Wine Month is that Bulgaria makes some excellent red wine. RED. That's important. Because the whites... not so much. Their Merlot is especially worth giving a look into, and I'm sure Mavrud is pretty good in the tiers above what I just tasted. 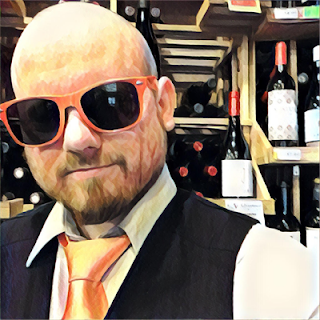 I'd like thank Vance Petrunoff from BulgarianWine.com for providing all of this wine and making the theme of this month happen. You can follow him on Twitter at @BGWine. I'd also like to thank my readers for making this the most successful month on TheWineStalker.net EVER. VINI Rosé 2013 - 5/5 - Holy crap! I fell in love with this rosé! Villa Yambol Merlot 2013 - 5/5 - An exceptional Merlot. Seriously exceptional. Domaine Boyar Merlot 2012 - 5/5 - It has a classy sweetness, not a crappy sweetness. VINI Cabernet Sauvignon 2013 - 4.5/5 - An outstanding example of Cabernet. VINI Chardonnay 2013 - 4/5 - Nice, mass-appeal Chardonnay. VINI Pinot Noir 2013 - 4/5 - A warm-climate fruit bomb! Villa Yambol Cabernet Sauvignon 2013 - 3.5/5 - Needs a few years to mellow out. VINI Merlot 2013 - 3/5 - What you should expect in Merlot for the $. Villa Yambol Mavrud 2013 - 3/5 - I *THINK* it's a good introductory Mavrud. Domaine Boyar Cabernet Sauvignon 2012 - 3/5 - Good and worth the $. Domain Boyar Royal Reserve Mavrud 2011 - 2/5 - Just didn't work for me. Domaine Boyar Traminer 2013 - 2/5 - One dimensional and boring. Domaine Boyar Chardonnay 2013 - 2/5 - A Sauvignon Blanc clone. VINI Sauvignon Blanc 2013 - 2/5 - Uncomfortable and unpleasant finish.